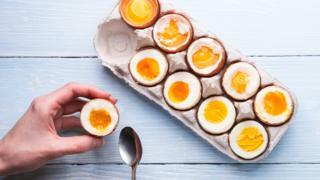 A study of nearly half a million people in China suggests a daily egg may reduce the risk of heart disease and strokes. According to current NHS advice, "although eggs contain some cholesterol, the amount of saturated fat we eat has more of an effect on the amount of cholesterol in our blood than the cholesterol we get from eating eggs". Most dietitians do not recommend frying an egg, because of the associated fat content and increased cholesterol intake.